Attr. 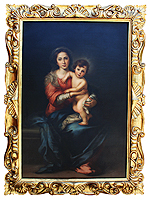 Giorgio Lucchesi (1855-1941) A Large and Impressive Early 20th Century Oil on Canvas "Madonna and Child" After Bartolomé Esteban Murillo (Spanish, 1618-1682) depicting a seated Virgin Mary with a baby Jesus Christ standing on her lap, within an ornate gilt wood carved frame. The original of this work dated 1638 is currently part of the collection at The Galleria Palatina (Palazzo Pitti), Florence, Italy. 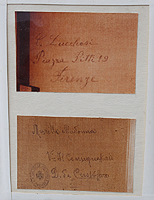 (Religned-Restored) The rear of the canvas inscribed "G. Lucchesi - Piazza Pitti 19 - Firenze" "Murillo Autoforma" (A Stamp and Signature from the Museum Conservatory authority*). Circa: Florence, 1910-20. Giorgio Lucchesi was an Italian School Artist born in Lucques on 26 December 1855 and died on 8 February 1941. Lucca Academy, becoming a pupil of Luigi Norfini, a painter of battle scenes, portraits and religious subjects. Lucchesi, however, soon turned to genre and landscape paintings, before specializing in the still life genre for which he is today best known. An oil on canvas titled "Raisins" is exhibited at the Modern Gallery at the Rome Museum. Attr. 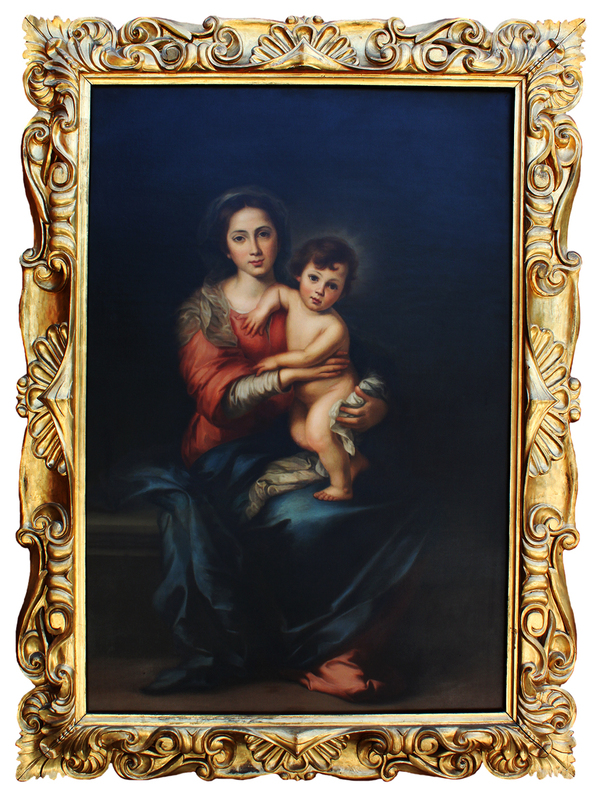 Giorgio Lucchesi (1855-1941) A Large and Impressive Early 20th Century Oil on Canvas "Madonna and Child" After Bartolomé Esteban Murillo (Spanish, 1618-1682) depicting a seated Virgin Mary with a baby Jesus Christ standing on her lap, within an ornate gilt wood carved frame. The original of this work dated 1638 is currently part of the collection at The Galleria Palatina (Palazzo Pitti), Florence, Italy. (Religned-Restored) The rear of the canvas inscribed "G. Lucchesi - Piazza Pitti 19 - Firenze" "Murillo Autoforma" (A Stamp and Signature from the Museum Conservatory authority*). Circa: Florence, 1910-20. Giorgio Lucchesi was an Italian School Artist born in Lucques on 26 December 1855 and died on 8 February 1941. Lucca Academy, becoming a pupil of Luigi Norfini, a painter of battle scenes, portraits and religious subjects. Lucchesi, however, soon turned to genre and landscape paintings, before specializing in the still life genre for which he is today best known. An oil on canvas titled "Raisins" is exhibited at the Modern Gallery at the Rome Museum. Bartolomé Esteban Murillo (Spanish 1618-1682) began his art studies under Juan del Castillo in Seville. Murillo became familiar with Flemish painting; the great commercial importance of Seville at the time ensured that he was also subject to influences from other regions. His first works were influenced by Zurbaran, Jusepe de Ribera and Alonso Cano, and he shared their strongly realist approach. As his painting developed, his more important works evolved towards the polished style that suited the bourgeois and aristocratic tastes of the time, demonstrated especially in his Roman Catholic religious works. In 1642, at the age of 26 he moved to Madrid, where he most likely became familiar with the work of Velazquez, and would have seen the work of Venetian and Flemish masters in the royal collections; the rich colors and softly modeled forms of his subsequent work suggest these influences. He returned to Seville in 1645. In that year, he painted thirteen canvases for the monastery of St. Francisco el Grande in Seville which gave his reputation a well-deserved boost. Following the completion of a pair of pictures for the Seville Cathedral, he began to specialise in the themes that brought him his greatest successes, the Virgin and Child, and the Immaculate Conception. After another period in Madrid, from 1658 to 1660, he returned to Seville. Here he was one of the founders of the Academia de Bellas Artes (Academy of Art), sharing its direction, in 1660, with the architect, Francisco Herrera the Younger. This was his period of greatest activity, and he received numerous important commissions, among them the altarpieces for the Augustinian monastery, the paintings for Santa Marìa la Blanca (completed in 1665), and others. E. Benezit Dictionaire des Peintres, Sculpteurs, Dessinateurs et Graveurs by Grund - Nouvelle Edition, 1976 - Volume 7, Page 6. *: The stamp and signature on the reverse has been obscured by the restoration. Clear images of the stamp and signature are attached to the protective backing.